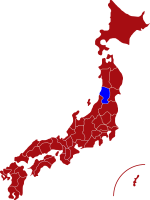 Yamagata Prefecture is located in the northern part of Japan’s main island, Honshu and less than three hours from Tokyo by the high-speed bullet train. The prefecture is blessed with many natural parks, stunning mountain ranges and over 100 wonderful hot spring resorts, such as Zao Onsen dating back to 110 AD and one of the oldest hot springs in the Tohoku region. 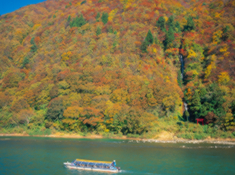 Amongst the many other sightseeing attractions is the Mogami Valley, with wonderful river cruises available throughout the year to really appreciate the stunning scenery. For more information about Yamagata prefecture, see their official tourism website. Air - Yamagata airport is located approximately 30 minutes by train from Yamagata city centre. The airport operates daily domestic flights to/from Tokyo, Osaka and Nagoya. Click here for its English website. Rail - The journey time from Tokyo using the Yamagata Shinkansen is 2 hours and 45 minutes. 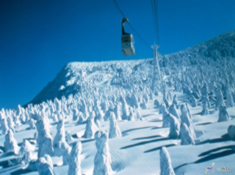 Zao Ropeway takes you to the summit of Mt. Zao to enjoy spectacular views of Zao and the picturesque Asahi Mountain Range. 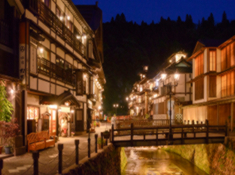 Ginzan Onsen is widely regarded as one of the prettiest hot spring resorts in Japan and a very popular destination for vistors to Yamagata. Mogami River Cruise is the perfect way to really appreciate the picturesque beauty of the Mogami River Valley. 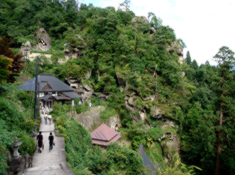 Risshaku-ji, also known as Yama-Dera (Mountain Temple), dates back to 860 AD and is officially designated a Place of Scenic Beauty and Historic Importance.